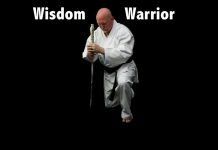 Judoka Rena Kanokogi otherwise known as Rusty, was born in Brooklyn, New York on July 30, 1935. She grew up rough in Coney Island and her mother, a hot dog salesman, often left her to her own devices. She got her nickname “Rusty” after a local stray dog. Rena began working at the age of 7 and by the time she was a teenager she lead her own street gang, known as the Apaches. In a dangerous world, strength was necessary, so in 1955 Rena began using her brother’s weights to work out. She also went to the local gym to train on a punching bag. In the mid-1950s, Rena married for a short time becoming Rena Stewart and they had a son. Divorcing soon after she was left a single mother. In 1955, Rena Kanokogi learned a judo technique from a friend and she immediately became interested in the martial art. She learned judo in her local neighborhood and loved the art because it calmed her down and helped her develop self-control, probably saving her life. It wasn’t long before she decided she wanted to compete. In 1959 there was a judo competition at the Utica, New York YMCA. Women were not specifically barred from competing, but no woman had ever tried. Wanting to compete, Rena disguised herself as a man. She cut her hair short and put an ace bandage around her chest, and, with her broad shoulders, she went unnoticed. She was an alternate on her team and the opportunity to compete presented itself when a male teammate was injured. Rena Kanokogi won the match, beating the reigning state champion while contributing to her team’s victory as well. Rena’s victory was short lived, however. She was pulled aside by the tournament organizer and he demanded to know if Rena was a woman. She told him the truth and she was stripped of her medal. This event had a profound impact on Rena and led her to a lifetime of commitment to women in the sport of judo. Rena Kanokogi vowed that no other woman Judoka would be humiliated as she had been. In 1962, after determining that there were no other options to continue her training in the United States, Rena traveled to the Kodokan in Tokyo, Japan. Women had been training in the Kodokan since 1926, but not with the men. A devastating opponent for the other women at the Kodokan, Rena was allowed to join the men, the first woman ever to do so. It was at the Kodokan that Rena was promoted to the rank of 2nd dan. There, she also met her second husband to be, Ryohei Kanokogi, who was a Black Belt in judo, karate, and jodo, and was on the Nichidai University judo team. In 1964, Ryohei was a 5th dan and Rena a 2nd dan, Rena married Ryohei in New York with judo master Kiyoshi Shiina as Best Man. Rena jumped full force into directing competitions and, in 1965, she directed the first junior judo tournament held in New York, the New York City YMCA Junior Judo Championships. The following year, she directed the New York Women’s Invitational Shiai. It was Rena who focused efforts to get national and international judo associations to organize women’s competitions. By 1976, Rena was serving as the coach for the US Women’s National Team. 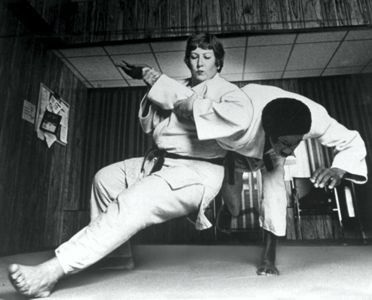 The team included one of the top women in judo in the 1970s, Maureen Braziel. 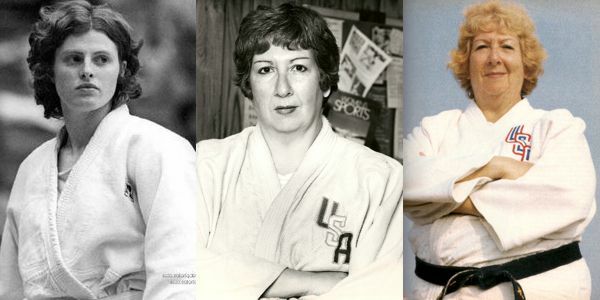 In 1980 she went on to organized the first women’s judo world championship in Madison Square Garden’s Felt Forum. To sponsor the event, she had to mortgage her home. It was Rena “Rusty” Kanokogi that was the driving force behind the introduction of women’s judo at the 1988 Summer Olympics. She was determined to sue the International Olympic Committee if women were not allowed to compete and she became the Coach of the first United States Olympic Women’s Judo Team. Margaret Castro, Rena’s personal student, would win an Olympic Medal at those Olympic Games. In 1991, Rena was inducted into the International Women’s Sports Hall of Fame. She was the first woman to be promoted to the rank of 7th dan in judo and in 2008, for outstanding contributions to the promotion of judo, Rena was awarded the Order of the Rising Sun, Gold Rays with Rosette, one of Japan’s highest honors for a civilian. In April 2009, Rena was inducted into the International Jewish Sports Hall of Fame. 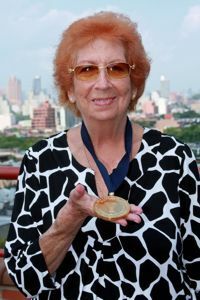 In August of the same year, the New York State YMCA awarded her a gold medal to honor her lifetime commitment to judo. This was some 50 years after she had been stripped of her judo medal in her first YMCA tournament. Rena “Rusty” Kanokogi died on November 21, 2009 at Lutheran Medical Center in New York City, New York after fighting a strong battle with multiple myeloma. 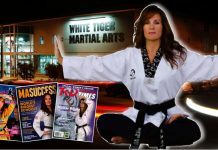 Every woman in the martial arts owes her a debt of gratitude. 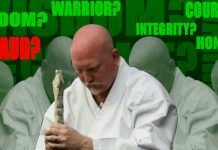 Bo Svenson, a Hollywood actor, writer, producer and director, and a high-ranking black belt in several arts as well as a USA Judo national coach, has obtained the rights to Rena’s life story and his company, MagicQuest Entertainment, will be producing Don’t Call Me Sir! A Courageous Woman’s Journey with Olympic Gold medalist Kayla Harrison portraying Rena.